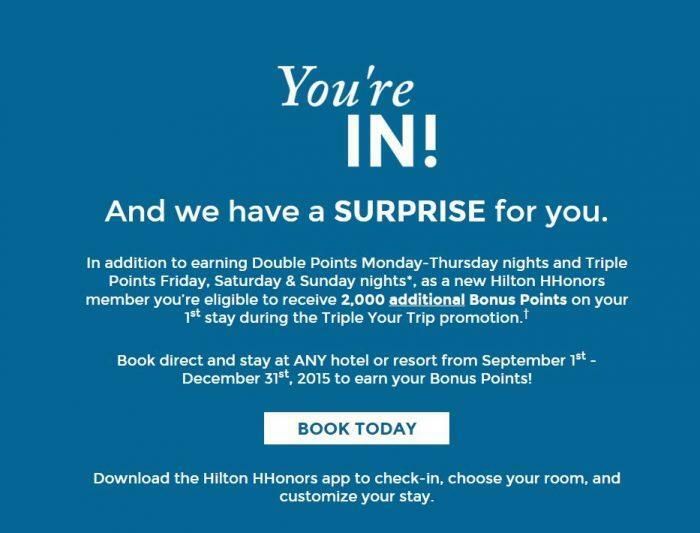 Hilton HHonors is bringing back its Triple Your Trip-promotion for stays between September 1 – December 31, 2015. You can earn double points for weekday nights (Monday, Tuesday, Wednesday & Thursday) and triple ones for weekend nights (Friday, Saturday & Sunday). Note that all the Hilton affiliated hotels are participating to this promotions. There are no excluded properties. EDIT: Some members may also be eligible for 2,000 bonus points for their first stay during the promo period after registering for this offer (not only new accounts). For the Triple Your Trip promotion, the Bonus Points you earn per night are calculated based on the average nightly folio of your total stay (average nightly folio is calculated by taking the total net folio of your stay during the Promotion Period, divided by the total number of nights of the stay). Triple Your Trip “Double Points” are awarded for Monday, Tuesday, Wednesday and Thursday nights in your stay. Triple Your Trip “Triple Points” are awarded for Friday, Saturday and Sunday nights in your stay. I like the fact that there are no excluded properties from this promotion (there was one promo recently that had 40% of the properties non-participating) and that it rewards weekday travelers too. Just remember to combine this promotion with all the other Hilton HHonors promotions that are currently on-going. The offer (“Triple Your Trip”) is valid for eligible stays completed between 1 September and 31 December, 2015 (“Promotion Period”) at any hotel or resort in the Hilton Portfolio. Hilton HHonors members must first register at HHonors.com/Triple prior to check-out of your stay within the Promotion Period. Registered HHonors members will receive the bonus only for nights completed during the Promotion Period, regardless of a check-in date before the Promotion Period begins or a check-out date after the Promotion Period ends. For the Triple Your Trip promotion, the Bonus Points you earn per night are calculated based on the average nightly folio of your total stay (average nightly folio is calculated by taking the total net folio of your stay divided by the total number of nights of the stay). Triple Your Trip Double Points are awarded for Monday, Tuesday, Wednesday and Thursday nights in your stay. For a detailed explanation of how points are issued for Triple Your Trip, please see Frequently Asked Questions. “Double Points” means you will receive a bonus equal to double the number of Base Points earned during a stay. Bonus Points earned on Base Points do not count toward tier qualification. Please allow six to eight weeks from completion of your stay for points to appear in your HHonors account. Offer is not transferable, is not valid for groups and cannot be combined with other select offers. Hilton HHonors™ membership, earning of Points & Miles™ when booking direct and redemption of Points are subject to HHonors Terms and Conditions. What is the name of this Hilton HHonors™ promotion? HHonors members will receive double points for the average nightly folio for qualifying Monday through Thursday nights of their stay and triple points for the average nightly folio for qualifying Friday, Saturday, and Sunday nights of their stay completed during the Promotion Period. What is the Promotion Period for the ‘Triple Your Trip’ HHonors promotion? An eligible stay is defined in the HHonors Terms & Conditions under Accrual of Points number 3. Click here to read more. What does Double and Triple Points mean? For the Triple Your Trip promotion “Double Points” means you will receive a bonus equal to the number of Base Points earned on the average nightly folio for qualifying Monday, Tuesday, Wednesday and Thursday nights. “Triple Points” means you will receive a bonus equal to twice the number of Base Points earned on the average nightly folio for qualifying Friday, Saturday and Sunday nights. Bonus Points earned on Base Points do not count toward tier qualification. Please allow 6-8 weeks from completion of your stay for the Bonus Points to appear in your HHonors account. How will the Double and Triple Points be calculated? Do I have to change my Double Dip® Earnings Style Option in my HHonors account in order to receive Double and/or Triple Points for this promotion? No. However, to maximize the number of points you can earn during the promotion, selecting HHonors Points and HHonors Points would be best. Yes. HHonors members must register for the promotion at HHonors.com/Triple. I am not an HHonors member; can I participate in this promotion? Yes. You can join the HHonors program for free, register for the promotion and immediately be eligible to participate. Simply visit HHonors.com/Triple and follow the steps to join HHonors and register for the promotion simultaneously. To make sure everyone has the most up-to-date Terms and Conditions, we have posted them on the website HHonors.com/Triple. Which Hilton HHonors brands are participating in the promotion? All Hilton HHonors brands are participating in the promotion: Conrad Hotels & Resorts, Curio Collection, Waldorf Astoria Hotels & Resorts, Hilton Hotels & Resorts, Embassy Suites, DoubleTree by Hilton, Hilton Grand Vacations, Hilton Garden Inn, Homewood Suites by Hilton, Home2 Suites and Hampton. No. A list of ineligible rates can be found under the HHonors Terms and Conditions: Accrual of Points number 3. Click here to read more. If I check-in before September 1, 2015 or check-out after December 31, 2015, do I still earn credit for that stay? Registered HHonors members will receive a bonus only for the nights of an eligible stay completed during the Promotion Period, regardless of a check-in date before the Promotion Period begins or a check-out date after the Promotion Period ends. Will I receive Double Points or Triple Points for any stays within the Promotion Period that I completed PRIOR to registering for the promotion? No. Only members registered prior to check-out will receive Double and/or Triple Points for nights within the Promotion Period. Will the Double and Triple points apply to all points received during the stay? The offer applies only to Base Point earnings for the nights during the Promotion Period and does not include Elite tier bonus or other Bonus Points. Can an HHonors member receive both Double Bonus Points and Triple Bonus Points with their stay? Yes. HHonors members are awarded Double Points for Monday, Tuesday, Wednesday and Thursday nights. Triple Points are awarded for Friday, Saturday and Sunday nights. A member will receive either Double or Triple Points for each night of their eligible stay within the Promotion Period. However, a member will not receive Double or Triple Points for the same night during the Promotion Period. When will the Bonus Points post to my HHonors account? Please allow 6-8 weeks from the completion of your stay for the Bonus Points to appear in your HHonors account. Yes. We can credit a maximum of 2 rooms. Will members earn Double and/or Triple Points for Reward Stays for this promotion? Members will earn Double and/or Triple Points for incidental charges at participating hotels within the Hilton HHonors portfolio during a Reward Stay, provided such charges are deemed eligible folio charges. This does not apply to incidental charges for stays at Hampton, Home2 Suites or Homewood Suites by Hilton. For a complete explanation, see number 14 under Accrual of Points here. If you have more questions about the Triple Your Trip promotion, please feel free to contact us at 800-548-8690. Outside the United Stated and Canada, please dial + 800 44 45 86 67.